The top of the practical and sophisticated Central Table flips down for easy storage—or just to move the table out of the way. A perfect dining table for a high-rise city balcony or indoor dining area, the Central Table has three legs and is available with a round or square bistro-shaped top. The frame and legs are cast aluminum. For tables with round tops, the frame is available polished or painted white or black; for tables with square tops, the frame is available in the painted version only. Tops are high-pressure laminate, square in white or black, round in polished aluminum, white, or black. 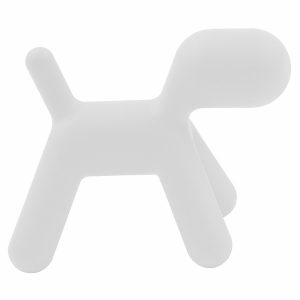 Painted black and white versions of both round and square tops are suitable for outdoor use. 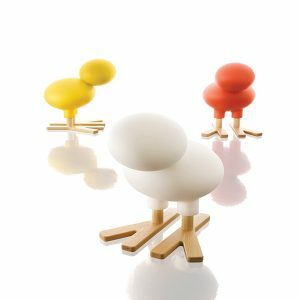 Dodo is a rocking chair/bird for children created by the Finnish designer Oiva Toikka, famed worldwide for his collection of glass birds designed for Iittala. 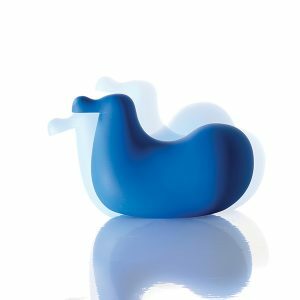 With Dodo the same fully defined shape of Toikka’s glass sculptures is now applied to plastic to create an object whose natural habitat lies both in the home and in the garden. Shaped to recall pebbles smoothed by water, the Gregg table lamps are made of blown glass and they cast a soft, warm glow. In the Be Colour! version, the base also becomes shiny, reflecting the light, and is available in gold or gunmetal, taking on a totally different personality: from a support, it becomes an accent. From a function, it becomes visual action, a sign. Happy Bird is a stylised bird based on cartoon characters. 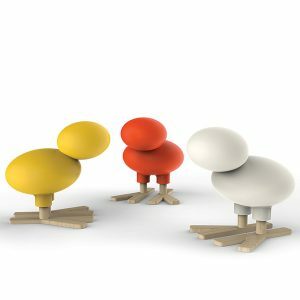 Its rounded form, colourful frame, and solid wooden legs make the perfect structure to allow children to climb on its back in complete safety. 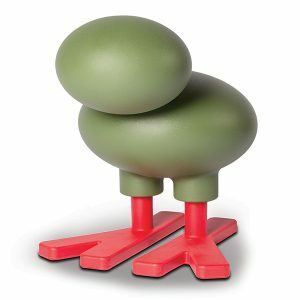 Me Too Happy Bird figure is both a toy and unconventional seat. 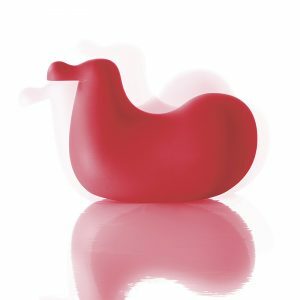 Originally created for Magis in 2009, the Paso Doble Chair showcases the signature flair of award-winning designer Stefano Giovannoni. Drawing on his background in industrial design, Giovannoni combines hard-wearing materials and superior finishes with clean lines and simple form for an instantly stylish chair that is built to last. Incredibly versatile, this chair will hold up well inside or out and makes a fine complement to coordinating pieces from the Paso Doble collection, or a superb contrast to pieces from other ranges. The Paso Doble Chair measures 46 x 82 x 56 cm and boasts a stackable design, meaning you can store multiple chairs away discreetly when they're not in use. These chairs are also designed to withstand wear and tear, with a durable aluminium base and polyester powder coating that will prevent corrosion, even when exposed to the elements. Although these chairs lack armrests, the gentle curves of the seat shell provide plenty of lumbar support and high levels of comfort for users of all shapes and sizes. 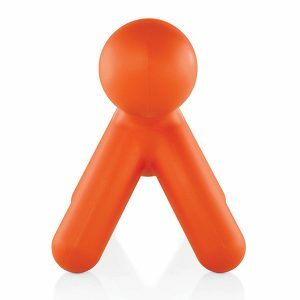 A head, a body and legs: essential, rounded shapes that come to life in a friendly, playful, durable and colourful object. 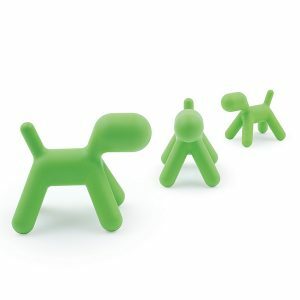 Made of polyethylene, and produced using rotational moulding, the piece is guaranteed to be both sturdy and lightweight, ready for endless moments of play and fun, both in the house and out of doors. 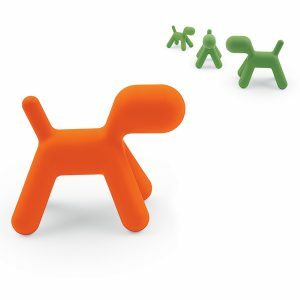 Puppy comes in orange, white, green and “dalmatian”, and in four different sizes, all made to measure for children, their tastes and their spaces.